Disqus 2012 will help websites better connect with their audiences. One of the first features to work toward this is the new Community view. This new view shows off the website’s top participants as well as some of the hottest discussions happening right now. Since starting Disqus, we’ve always had the goal of building stronger communities through the platform that we were building. As adoption of Disqus grew around the web, a curious thing happened: websites were telling us that they were seeing increased traffic through Disqus. People weren’t just commenting — they were discovering new stories through the discussions and the people participating. With the new Disqus 2012, we’ve even heard that Disqus has started showing up as a top traffic source — in one example, traffic driven by Disqus delivered more pages per visit and a higher visit duration than other sources. It’s great to see that discovery is already happening with the new platform. The brand new Community view is a way for people to find top commenters and hot discussions on the site. 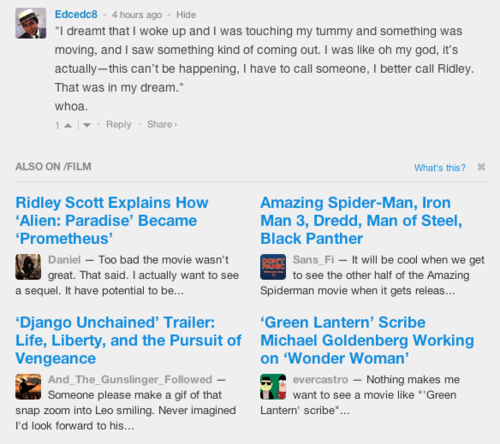 Starting today, we’re slowly rolling out a new discovery feature of the new Disqus 2012: the Discovery box. The Discovery box is a major extension of our promise to make discovery a natural part of how people use Disqus on sites all over the web. To us, discovery is not any one feature — it’s a benefit that is woven throughout the new Disqus experience. The current story and discussion that’s on the page. What we think would be most interesting to the reader. We’re very excited about what the Discovery box and other discovery features will do to bring more value for sites and build a better experience for their readers. The Discovery box is being slowly rolled out on sites. As we move closer to Disqus 2012’s general release, you’ll begin to see the new platform’s discovery features in more places. So far, you can see it appear on some sites like Slashfilm, Major Nelson, and Twitchy. How else should Disqus enable discovery? Let us know in the discussion.